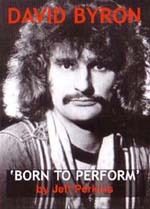 Uriah Heep and David Byron fan has written a very readable and well researched on Uriah Heep's original vocalist David Byron, who sadly passed away back in 1985. Unlike many fan-penned biographies Jeff Perkins manages to avoid it being a 'starry eyed' look where the hero of the piece can/did do no wrong. It is a measured account in that it rightly points out what a waste of a talent and life it was with David Byron's heavy drinking habit, that eventually killed him via liver disease. The author is very good at recalling his own Heep live experiences as well as those of fellow fans, to build an interesting picture of Byron and Uriah Heep on stage and record. Byron was the consummate rock star, both on and off stage and as often happens when the limelight fades he was frequently unable to cope. Reading this life story I thought how much it mirrored the life of fellow 70's rock singer, the Sweet's Brian Connolly. Both singers rapidly went down hill health wise after leaving their respective bands. Plenty of detail on Byron's schooling, early years, the Heep period, including interviews with current and past members. What was a revelation to me was Byron's post-Heep work in both Rough Diamond and the Byron Band (that also featured a youthful Robin George). I'll be honest and say I knew little of this time and full credit to this book in that I am eager to seek out more music wise. One final unique feature is the 'biography of a biography' sections, which give a fascinating insight into how the author researched and wrote this biography. A must read for all Heep fans and anyone who enjoys well-written rock biographies (as opposed to the numerous cut 'n' paste cash-in biographies that litter bookshops).